GALION — Victory Lanes in Galion will be the home of the Northmor Golden Knights bowling squads again for the 2017-2018 season. Russ Montgomery will once again lead the Knights to lanes around the area for his sixth season as the Northmor head coach. 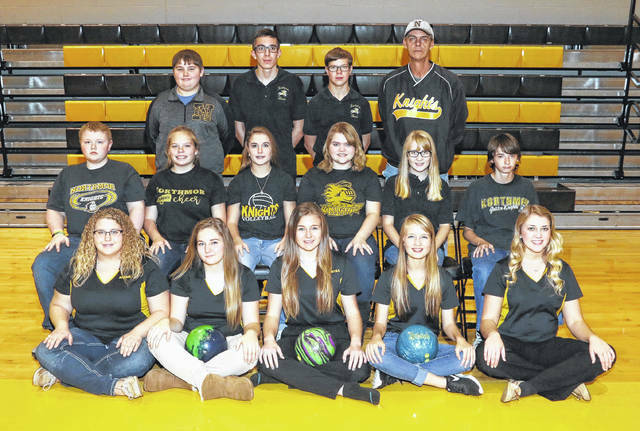 A season ago, Montgomery saw his girls team finish 14-6, 6-4 in the Mid-Ohio Athletic Conference Blue Division, and end their season finishing eighth at the OHSAA Division II State Bowling Tournament. The boys team from Northmor did not fare as well at 5-15 overall and winless in the MOAC Blue at 0-10. Two of the girls from that state placing team have graduated but the Lady Knights will return a wealth of experience this season. Caitlin Adkins, first-team all-conference and Shelbey Lilly, second-team all-conference, graduated last spring. Northmor made it to the state match after a second place finish at sectionals and a third place finish at districts. Sam Eichorn, honorable mention MOAC Blue, graduated from the boys team. That girls team will be returning four all-conference honorees from a season ago. Seniors Chloe Meier, Sara Drumm, Sammy Grogg and Alexis Yarnell will all be back on the lanes for the Lady Knights in 2017-2018. Grogg earned an honorable mention nod last season while Meier, Drumm and Yarnell all finished as second-team all-conference members. Yarnell was also named to the all-Ohio squad. Other bowlers returning for coach Montgomery are: Tori Carver, Sarah Dudley and Ricky Borders. Northmor’s season kicks off on Saturday, November 18 at the Victory Lanes Warm-up Tourney in Galion. KMAC competition begins on Saturday, December 2 with a trip to faceoff against the Highland Fighting Scots. “Winning the league is always the primary goal. Finding a way to win the close matches is a priority. If the bowlers believe in themselves and their abilities, they’ll do well,” concludes Montgomery.